Arrival to Beirut International Airport. Meet & assist by our representative. Transfer to the hotel and overnight. Breakfast at the hotel. Departure for a sightseeing tour in the Capital Beirut, including the renovated Down Town, the National museum and the "corniche". Breakfast at the hotel. Departure to the Beqaa Valley. Stop at Chtaura. 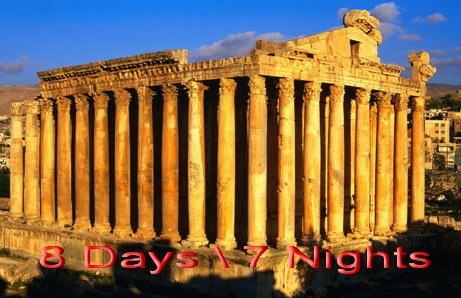 Continue to Baalbeck and visit the temples of Jupiter, Bacchus and Venus. Proceed to Anjar to visit of the Umayyad city. Return to Beirut and overnight. Breakfast at the hotel. Free Day at leisure or shopping in Beirut Souks as Hamra area, Down Town, Verdun and other regions. Return to Beirut and overnight. Breakfast at the hotel. Departure to visit Byblos, including the archeological site, the old souks and the ancient port. Return to Beirut and overnight. Breakfast at the hotel. Departure to the Chouf region. Stop at Deir El-Qamar, the capital of Lebanon in the 17th century. Proceed to Beiteddine and visit the palace of Emir Bechir. Return to Beirut and overnight. Transfer to the airport and assistance for final departure.